Mumbai, June 23: Prominent social, educational, religious and human rights Muslim NGOs, based in Mumbai, strongly condemn the human rights abuses and unchecked killing spree of innocent people in Iraq and Syria, whether it is by the ISIS(L), the forces of Bashar-al-Assad or Iraqi Army under Noori-al-Maliki. 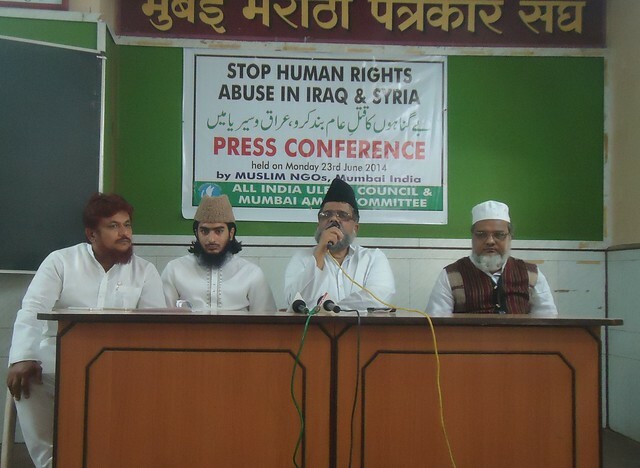 To explain on the issue Muslim NGOs have called for a press conference today at Marathi Patrakar Sangh, Mumbai, where Maulana Mahmood Daryabai, General Secretary, All India Ulama Council; Maulana Burhanuddin Qasmi, Director Markazul Ma’arif Education & Research Centre; Maulana Mohammad Zakir Qasmi, General Secretary, Jamiat Ulama-e Maharastra; Maulana Ejaz Kashmiri, Imam, Handiwali Masjid and Mr. Farid Shaikh, Presdent, Mumbai Aman Committee along with others have addressed the press. We strongly decry the terming of the conflict in Iraq and Syria as a Sunni-Shia clash. The fighting in both these countries needs a political solution because the people are fed up of the two inept governments and are eager for change, the change must come. We appeal to the USA, Iran, Saudi Arabia and the other power houses in the region not to interfere in the internal matters of these countries. They should let the matter be solved by the people themselves through political dialogue rather than use of arms. We appeal to the UN and the international community to urgently seek a solution to the humanitarian crisis unfolding in the region. And we do appeal to the opposing forces to respect human rights of all citizens by all means.